A pair of plain polished Christian cross stud earrings made in 14k solid yellow gold. The cross earrings measure 10mm x 6mm in size (under 7/16" tall x 1/4" wide). Includes secure, friction push-back post closures. 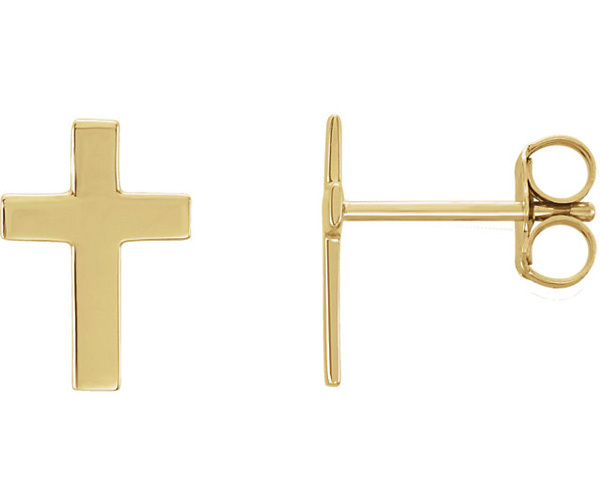 See our variety of Christian cross stud earrings, shown below. We guarantee our Plain Polished Christian Cross Stud Earrings, 14K Yellow Gold to be high quality, authentic jewelry, as described above.